"Monte dei Paschi di Siena" redirects here. For the banking foundation, see Fondazione Monte dei Paschi di Siena. Banca Monte dei Paschi di Siena S.p.A. (Italian pronunciation: [ˈbanka ˈmonte dei ˈpaski di ˈsjɛːna]) (BMPS) is the oldest surviving bank in the world and the Italian third largest commercial and retail bank by total assets, according to research from Ricerche e Studi, using 2014 data. However, the proposed merger of Banco Popolare and Banca Popolare di Milano would make Banca MPS ranked as the joint-third, using 2015 data (both around €170 billion total assets as at 31 December 2015). Founded in 1472 by the magistrate of the city state of Siena, Italy, as a "mount of piety", it has been operating ever since. In 1995 the bank (Monte dei Paschi di Siena) was transformed from a statutory corporation to a limited company (Banca Monte dei Paschi di Siena), which Fondazione Monte dei Paschi di Siena was the by-product to continue the charity function of the bank. Today Banca MPS has approximately 2,100 branches, 26,000 employees and 5.3 million customers in Italy, as well as branches and businesses abroad. A subsidiary, MPS Capital Services, handles corporate and investment banking. Banca MPS's largest shareholder was the Fondazione Monte dei Paschi di Siena before the 2013 bailout. Banca Monte dei Paschi di Siena was founded by order of the Magistrature of the Republic of Siena as Monte di Pietà in 1472, when its statute was approved. Since then the bank has been in operation without interruption to the present day. It is therefore considered the oldest bank in the world still operating. At the base of its foundation appears to be the "Statuto dei Paschi", written in 1419 for the regulation of all activities related to agriculture and pastoralism in Maremma. Its current form dates from 1624, when Siena was incorporated in the Grand Duchy of Tuscany and Grand Duke Ferdinando II granted to depositors of Monte, in their warranty, the income of the state-owned pastures of Maremma (the so-called "Paschi" which gave the bank its name). The bank consolidated and increased its banking activity during the 17th and 18th centuries. With the unification of Italy, the bank expanded its business throughout the Italian peninsula, initiating new activities, including mortgage loans, the first experience in Italy. MPS was also involved in the bail-out of Cassa di Risparmio di Prato, becoming the major shareholders. In 1995, a decree of the Ministry of the Treasury of the Italian Republic dated 8 August 1995, gave rise to two institutions: Banca Monte dei Paschi di Siena S.p.A and Fondazione Monte dei Paschi di Siena, a non-profit organization with the statutory purpose of providing assistance, charity and social utility in the fields of education, science, health and art, especially with reference to the city and the province of Siena. On 25 June 1999, Banca Monte dei Paschi di Siena was listed successfully on the Italian Stock Exchange. At the same time, the bank upgraded its commercial productivity, with the aim of improving the level of assistance and consultancy to investors and businesses, and updated its activities in private banking and in private pension plans. At the conclusion of this plan of expansion, the bank implemented a vast program of opening new branches of the Group, with more than 2,000 branches. In order to finance this expansion model, the bank entered into some derivatives that were hidden: operations Santorini in 2002 and Alexandria in 2006. On 8 November 2007, Monte dei Paschi di Siena announced that it had reached an agreement with Banco Santander to buy Antonveneta for €9 billion excluding the subsidiary Interbanca that is owned by the Spanish bank. Antonveneta is the bank that after the Bancopoli scandal was acquired by ABN AMRO and was supposed to go to Banco Santander after the purchase of the Dutch bank by the consortium of RBS, Santander, Fortis. From February 2007 to June 2008 Banca MPS sold all the shares (27.839%) in Finsoe, an intermediate holding company of Unipol Group, for €584.8 million. In 2008, Quadrifoglio Vita, a joint venture insurance company of Unipol and Banca Agricola Mantovana, was acquired by AXA from Unipol via Banca MPS, Banca Agricola Mantovana was also absorbed into Banca MPS. Banca MPS also acquired regional bank Cassa di Risparmio di Biella e Vercelli from Intesa Sanpaolo in December 2007 for about €399 million. In the wake of rising yields and declining valuations on Italian government debt in the European sovereign-debt crisis, MPS lost over $2 billion in the first half of 2012, had to recapitalize, and faced restructuring or worse. The majority owner until the recapitalization, the Fondazione Monte dei Paschi di Siena, long resisted issuing new capital which would dilute its holding. In September 2012, even after the dilution, the bank "appear[ed] poised" also to give the national government a greater ownership stake in return for more capital. In December 2012, Cassa di Risparmio di Biella e Vercelli was sold to Cassa di Risparmio di Asti for about €205.5 million. In 2009, the Santorini and Alessandria operations began creating huge losses. In order to hide them in the bank's financial statements, the top management, including Giuseppe Mussari, the bank president, chose to enter into derivative contracts with Deutsche Bank and Nomura. Estimates of the losses accumulated by the Santorini and Alessandria operations in the period leading up to the derivative contracts range from €500 to €750 million. The documentation concerning these operations was never communicated to the bank's own auditors or the Banca d'Italia. The derivative contracts and related documentation were discovered and made public by the new board of the bank at the end of November 2012. The documentation was then forwarded to the Banca d'Italia between December 2012 and mid-January 2013. The shareholders and the analysts have ascertained that the bank had not declared losses from derivatives. On 22 January 2013, the bank's shares lost 5.6% on the stock exchange and Mussari resigned as president of Associazione Bancaria Italiana. On 23 January 2013, the scandal of the hidden derivatives was revealed. The bank's shares dropped 8.43% on the stock exchange. On 24 January 2013, the bank's shares dropped another 8% on the stock exchange. On 25 January 2013, an extraordinary general meeting of the shareholders of the bank was convened. They resolved to grant the Board of Directors the power to increase the share capital by a maximum amount of €4.5 billion to service the exercise of conversion rights of the bank of the Monti bonds. MPS called for an intervention of €3.9 billion, including €1.9 billion for the replacement of the previous Tremonti bonds. The delegation of the extraordinary powers to the Board of Directors has also included the possibility of increasing the share capital of €2 billion at the exclusive service of the payment of interest payable in shares. The shareholders approved with a 98% vote in favour. After the vote, the bank recovered 11.36% on the stock exchange after having lost more than 20% of its value in three sessions in three days. On 26 January 2013 the Banca d'Italia (Bank of Italy) approved a bailout request from the bank for €3.9 billion ($5.3 billion). The firm sparked fresh controversy in 2013 when it was accused of misleading Italy's market regulator in October 2012, shortly before it received a 4.1-billion euro ($5.47 billion) state bailout. On 29 December 2013, Fondazione Monte dei Paschi di Siena rejected plans for issuing €3 billion worth of new shares, delaying the raising of capital until at least May 2014 and increasing the risk of nationalization. In March 2014, BlackRock acquired a 5.748 percent stake in the bank (as the bank was still a component of stock market indice). In July, the capital increase was completed, which the banking foundation had just owned 2.500% shares only. In October, the bank failed the ECB's stress test of major European banks, (Single Supervisory Mechanism) and was given two weeks to prepare a plan to raise €2.11 billion in capital shortfalls. Despite issuing €5 billion in shares just four months earlier, the bank was declared not able to withstand a financial catastrophe by the European Central Bank. Shares proceeded to plummet 22%. In November, 2014, the bank reported a loss of €1.1497 billion in the 3rd quarter of the year. Eventually in 2014 financial year, the bank had a net loss of €5.3429 billion, making the capital increase vaporized. The Tier 1 capital ratio of the bank was 8.7% as at 31 December 2014. On 6 July 2015, following the Greek bailout referendum, trading in Monte dei Paschi shares was suspended after they fell 5.7%. Eventually Banca MPS achieved a net profit of €388 million in 2015. but mainly due to the effect of the restatement as a CDS derivative of the Alexandria transaction. The CET1 capital ratio of the bank was 12%, mainly due to another capital increase during the year, which the European Central Bank required Banca MPS to have a minimum of 10.75% from 31 December 2016 onward, or 10.2% in the transitional period. Moreover, both the gross (34%) and net non-performing loan to total loan ratio (22%) were still higher than the Italian average (18.1% in gross and 10.8% in net at December 2015) and the Italian average itself was higher than the European Union average. On 21 January 2016 MPS securitized €1.6 billion performing lease receivables portfolio for a value of €1.4173 billion. The bank repurchased €656 million of the securities (tranches B to D) and sold €761.3 million of the securities to the market (tranche A). In April 2016 German Bundesbank board member Andreas Dombret commented that many Greek and Italian banks were zombie banks that were kept for political reason. He urged that European Central Bank should deal with banks with high level of non-performing loans. However, he did not state specifically if BMPS were one of the zombie banks or not. On 23 June a gross value of €290 million bad loan portfolio was disposed without recourse (Italian: pro-soluto) to Kruk Group. On 4 July the bank confirmed that a request of reducing non-performing loans from European Central Bank was received. In 2015 the bank had €46.9 billion NPLs in gross and €24.2 billion in net. The bank targeted to reduce the gross NPLs to total loans ratio to 20% in 2018. However, still higher than Italian average at 31 December 2015. On 29 July 2016, 2016 European Union bank stress test was announced. Among the 51 banks in the test, BMPS was the only bank that CET1 ratio (in full Basel III basis) was forecast as negative in the adverse scenario. On the same day, the plan to recapitalize the bank for €5 billion was announced; the bank also planned to securitize the entire bad loan portfolio for a target of €9.2 billion, which had a net book value of €10.2 billion as at 31 March 2016. The junior trenche would be allocated to the shareholders of the bank (for €1.6 billion); the mezzanine trenche would be sold to Atlante for €1.6 billion; the senior trenches would be sold to the market with some of them would eligible to state guarantee (Garanzia sulla Cartolarizzazione delle Sofferenze) for €6 billion. It was expected to reduce the gross NPLs ratio to 17.8%, on par with Italian average but still higher than European peer. MPS headquarters in the Palazzo Salimbeni in Siena hosts an art collection and a large number of priceless historical documents spanning the centuries of its existence. However, this collection is not usually open to the public. Most recent publicly known acquisition of art, a gold-plated panel by Segna di Bonaventura, cost the bank nearly one million Euro. It is also internationally known as the primary sponsor of Italian basketball club Mens Sana Basket of Siena, currently in Lega A and a regular participant in the Euroleague. In 2010, the bank was funding the expansion of a small airport in the heart of the Tuscan countryside, Siena-Ampugnano Airport, to become an international airport. Both international and local groups had raised objections to this expansion on the grounds it would damage the natural beauty of the area, the environment and the attraction of the countryside to tourism. Eventually, Aeroporto di Siena S.p.A., the companies incorporated for the project, was liquidated . Until the euro-crisis, profits from the bank financed the Palio di Siena, Siena's historic-building renovations and "biotech programs" intended to turn the Tuscan plain into a research hub. Nearly all that money – $150 million a year, on average, from 1996 to 2010 – has "evaporated" since 2010. According to the annual report of the banking foundation, which acted as both the largest shareholders of the bank and the charity organization for Tuscan area, the foundation suffered a sharp decrease in revenue from the bank in 2009, which dropped from €340 million to just €62.5 million, thus affecting the endowment to other organizations. Along with other loss related and not related to the bank since 2010, the foundation had to suspend all the endowment to other organizations. The share owned by Fondazione Monte dei Paschi di Siena dropped from over 55% on 10 December 2009 to below CONSOB requirement to disclose (<2%) in 2015. 1 2 "2015 Draft Annual Report" (PDF). Banca Monte dei Paschi di Siena. 25 March 2016. Retrieved 7 April 2016. ↑ "English version of the corporate website". MPS Capital Services. Retrieved 8 July 2013. ↑ Ministry of the Treasury (28 August 1995). "Approvazione del progetto di ristrutturazione del Monte dei Paschi di Siena" (in Italian). Italian Republic Official Gazette. Retrieved 9 April 2016. ↑ "2003 annual report" (PDF). Banca Popolare di Vicenza. 30 June 2004. Retrieved 8 March 2016. ↑ "doppio-flop-derivati" (in Italian), Ilsole24ore 24 January 2013. ↑ "PRESS RELEASE" (PDF). Banca Monte dei Paschi di Siena. 8 November 2007. Retrieved 20 April 2016. 1 2 "mussari-lascia-presidenza" (in Italian) Ilsole24ore, 22 January 2013. ↑ "Bilancio al 31 dicembre 2006" (PDF) (in Italian). Banca MPS. 22 March 2007. Retrieved 23 February 2016. 1 2 "2008 Bilancio Consolidato" (PDF) (in Italian). Banca MPS. 10 April 2009. Retrieved 23 February 2016. ↑ "JOINT PRESS RELEASE SALE OF 55% OF BIVERBANCA FINALISED". Intesa Sanpaolo & Banca Monte dei Paschi di Siena. 20 December 2007. Retrieved 16 February 2016. 1 2 Birnbaum, Michael, "In Italy, world’s oldest bank faces uncertain future", Washington Post, 1 September 2012. Retrieved 2 September 2012. ↑ "Bilancio d'esercizio e Consolidato 2012" (PDF) (in Italian). Cassa di Risparmio di Asti. Retrieved 16 February 2016. ↑ "Bilancio d'esercizio e Consolidato 2012" (PDF) (in Italian). Banca Monte dei Paschi di Siena. 29 April 2013. Retrieved 16 February 2016. ↑ "ombre-derivati-monte-titolo" (in Italian), Ilsole24ore, 24 January 2013. ↑ "borsa-tokyo-chiude" (in Italian), Ilsole24ore, 23 January 2013. ↑ "eurozona-atteso-calo-lindice" (in Italian), Ilsole24ore, 24 January 2013. ↑ "assemblea-mps" (in Italian), ilsole24ore.com, 25 January 2013. ↑ "borsa-tokyo-chiude-forte" (in Italian), Ilsole24ore, 25 January 2013. ↑ Mozee, Carla, "Bank of Italy OKs bailout for scandal-hit bank", MarketWatch, 26 January 2013. Retrieved 26 January 2013. ↑ Silvia Aloisi and Stefano Bernabei (23 August 2013). "Monte Paschi accused of misleading Italy regulator in 2012". Reuters. ↑ Valentina Za (29 December 2013). "Monte Paschi faces nationalization threat after cash call delay". Yahoo Finance. ↑ "BlackRock buys 5.75 percent of Monte dei Paschi". Reuters. 24 March 2014. Retrieved 24 March 2014. ↑ "Nearly $1 billion loss for 3rd quarter", New York Times, November 12, 2014. ↑ "CONSOLIDATED INTERIM REPORT ON OPERATIONS AS AT 30 SEPTEMBER 2014" (PDF). Banca Monte dei Paschi di Siena. 21 November 2015. Retrieved 14 March 2016. ↑ "2014 Annual Report" (PDF). Banca Monte dei Paschi di Siena. 19 June 2015. ↑ "Greek debt crisis: Markets resilient after 'no' vote". BBC News. ↑ "BMPS: BOARD APPROVES RESULTS AS AT 31 DECEMBER 2015" (PDF). Banca MPS. 5 February 2016. ↑ "Rapporto sulla stabilità finanziaria N°1 - 2016" [Financial Stability Report N°1 - 2016] (PDF) (in Italian). Banca d'Italia. 29 April 2016. Retrieved 1 May 2016. ↑ "BANCA MPS: NEW LEASE SECURITISATION FOR EUR 1.6 BLN PORTFOLIO" (PDF). Banca Monte dei Paschi di Siena. 21 January 2016. Retrieved 9 April 2016. ↑ "ECB should tackle zombie banks, Germany's Bundesbank says". Reuters. 18 April 2016. Retrieved 21 April 2016. ↑ "Banca MPS: disposal of a non-performing loan portfolio for about Euro 290 mln". BMPS. 23 June 2016. Retrieved 11 July 2016. ↑ "Press release". BMPS. 4 July 2016. Retrieved 11 July 2016. ↑ "2016 EU‐WIDE STRESS TEST Results" (PDF). European Banking Authority. 29 July 2016. Retrieved 30 July 2016. ↑ "Structural and definitive solution to the bad loan legacy portfolio" (PDF). BMPS. 29 July 2016. Retrieved 1 August 2016. ↑ Susan Moore (7 March 2009). "Old Masters remain unscathed by the downturn". Financial Times. Retrieved 14 June 2009. ↑ Lambton, Fred. "Saving Siena". The Spectator. ↑ Peter Popham (19 January 2008). "Plans for a new airport bringing cheap flights to Tuscany provoke furious opposition". The Independent. London. Retrieved 13 May 2010. ↑ "2009 Bilancio" (PDF). Fondazione Monte dei Paschi di Siena (Fondazione MPS) (in Italian). ACRI archive. 5 May 2010. Retrieved 14 March 2016. ↑ "2010 Bilancio" (PDF). Fondazione MPS (in Italian). ACRI archive. 28 April 2011. Retrieved 14 March 2016. ↑ "2011 Bilancio" (PDF). Fondazione MPS (in Italian). ACRI archive. 16 July 2012. Retrieved 14 March 2016. ↑ "2012 Bilancio" (PDF). Fondazione MPS (in Italian). ACRI archive. 10 May 2013. Retrieved 14 March 2016. ↑ "Azionisti rilevanti di BANCA MONTE DEI PASCHI DI SIENA SPA". CONSOB. 10 March 2016. Retrieved 14 March 2016. ↑ "Azionisti ...", CONSOB, 10 December 2009. 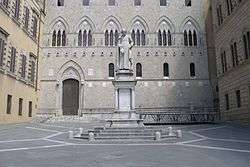 Wikimedia Commons has media related to Banca Monte dei Paschi di Siena.